One of my favorite Malaysian noodle dish is laksa. 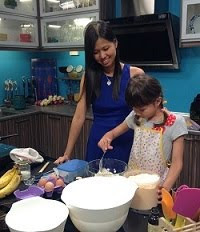 There are many different types of laksa - curry laksa (with coconut based curry soup), assam laksa (sourish fish-based soup) and each state also have their own specialty. It was only last year that I got my first taste of Sarawak laksa and I instantly fell in love with it. 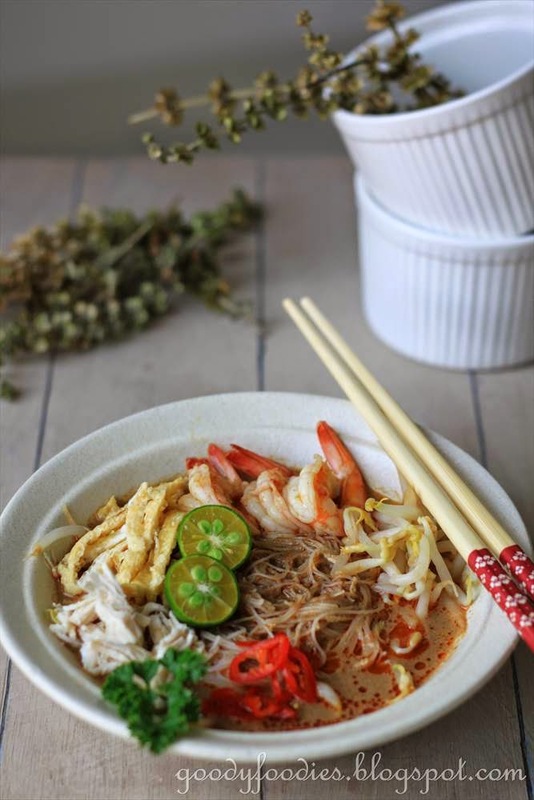 Sarawak laksa's broth is made with a paste of shallots, galangal, lemongrass, dried chillies, herbs and spices, as well as chicken stock and coconut milk. Fortunately for me, I won a packet of Sarawak paste from Kelly's giveaway last year which I finally put into good use last week. 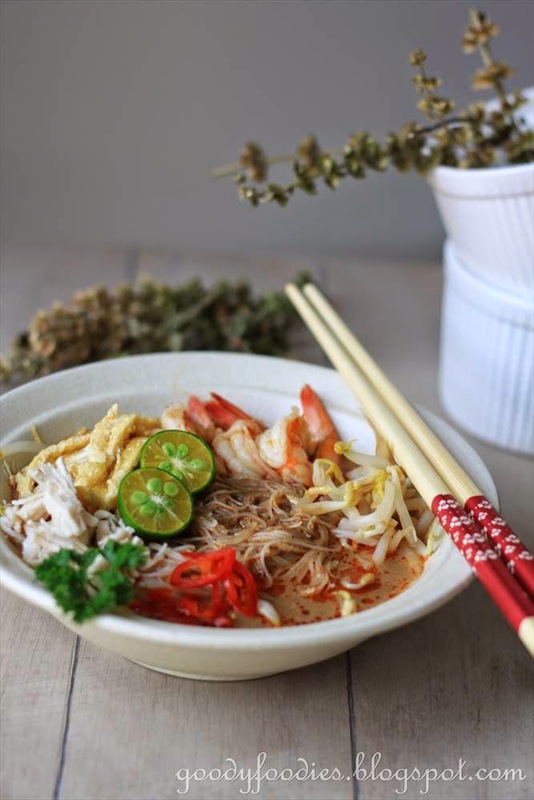 A traditional bowl of Sarawak laksa comes with meehoon (rice vermicelli), omelette strips, shredded chicken, beansprouts, prawns, fresh coriander and lime. 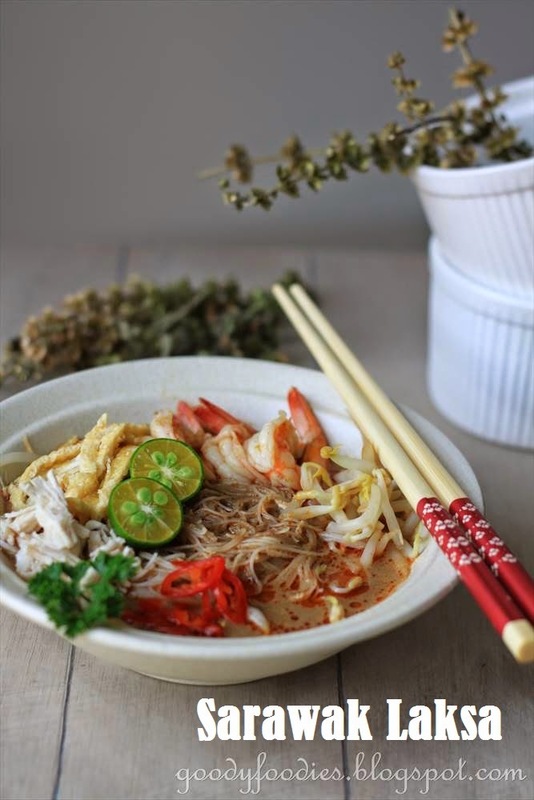 First and foremost, the chicken is poached in the chicken stock and set aside, then the stock is simmered with the Sarawak laksa paste and prawns shells and heads for 30 minutes. I also saw on Arthur's blog that one can use ikan bilis (dried anchovies) in lieu of prawn shells, which is what I did the second time I cooked it since I ran out of prawns shells/heads. Because the paste has a lot of herbs and spices, it needs to be strained and coconut milk is added to the broth before serving. Just before eating, add a squeeze of lime for the perfect bowl. My family absolutely loved it (even my kids each enjoyed a small bowl of it), so much so that I cooked it twice in one week! The broth is really tasty - it has a unique and aromatic peppery taste, with a sourish end note. It is also very appetizing (and not too rich/heavy), that you just don't want to stop until you've licked the bowl clean. I honestly do think this is one of the best laksa variants around. 1. Place chicken stock in a saucepan, then bring to the boil. Once boiling, place chicken in and lower to a simmer and simmer for about 8 minutes. After 8 minutes, turn off the heat and leave the chicken to steep for another 8 minutes. Remove from heat and set aside. Once cool, shred the chicken using 2 forks. 2. Turn on the heat and add the laksa paste and prawn shells/head (or dried anchovies). Simmer over low heat for 30 minutes. 3. Beat egg and season with a dash of light soy sauce. In a separate pan, heat the oil and add the egg. Cook each side for about 2 minutes, until golden brown. Remove and set aside. Once cool, cut into thin long strips using a sharp knife. 4. Bring a pot of water to boil in a separate pot. Over medium heat, blanch the rice vermicelli for about 2 minutes,or until cooked, to manufacturer's instruction. Remove and set aside. Blanch the beansprouts for about 30 seconds. Remove and set aside. 5. Strain the stock through a sieve from Step 2 to remove the prawn shells/ laksa paste residue / ikan bilis. Bring the stock back to the boil and blanch the prawns in the stock for about 20 seconds, or until cooked. Remove and set aside. Add the coconut milk and bring to the boil. Taste and season with salt or chicken stock granules as necessary. 6. 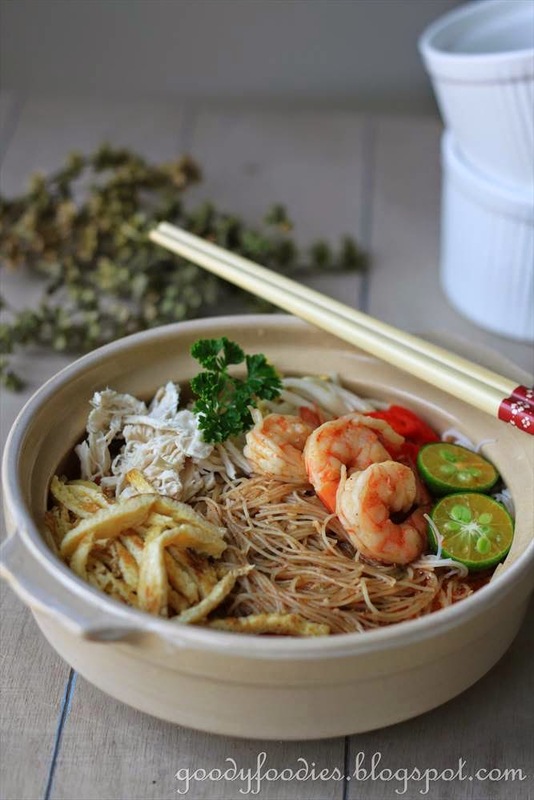 To assemble, place rice vermicelli in bowl, topped with shredded chicken, beansprouts, prawns and omelette. Ladle over hot soup, then garnish with red chillies, coriander/parsley and calamansi lime. Just before eating, squeeze over the lime. Enjoy! 1. If you do not have prawn shells for the stock, you can replace with 15g dried anchovies (ikan bilis). If you cannot get hold of grated fresh coconut, then replace with packet coconut milk. 2. I used "Cap Helang Matahari" laksa paste - 300g pack can serve 6 pax. For every 100g of paste, use 800ml of chicken stock. Indeed looks yummy and mouth watering!! And the key ingredient is the laksa paste. It sure looks good. This Helang brand is currently the best - since the Swallow brand went crashing out after the younger generation took over the business. Yen, I have heard so much about Sarawak Laksa but I haven't eaten it yet. \outl0\strokewidth0 \strokec2 I'm staying in Kuching. A bowl of good Sarawak laksa is not cheap. Shall attempt cooking own one day. Thanks for sharing. 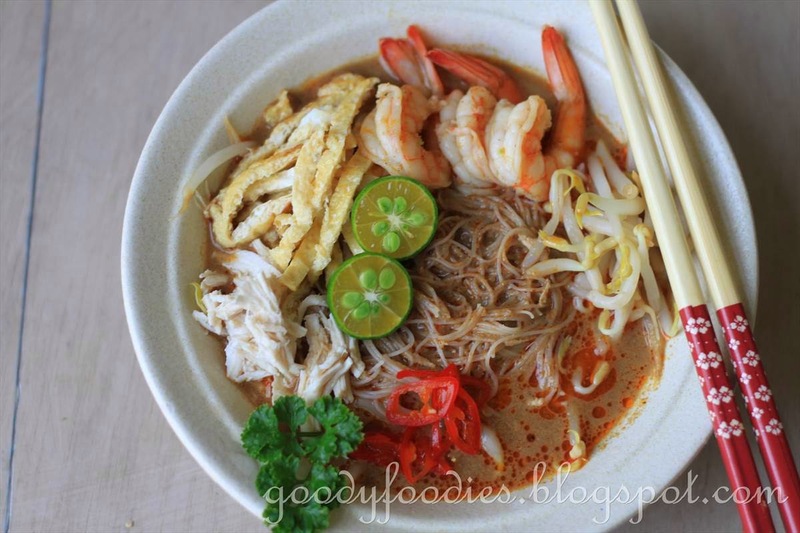 Oh Yen, I never have Sarawak laksa b4 but from what your photos showed here, thumbs up! 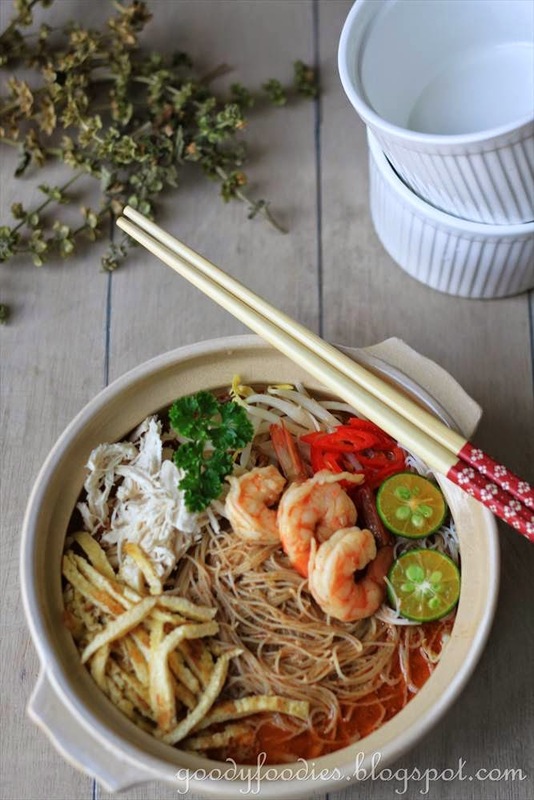 Such a delicious bowl of laksa! I love eating laksa but can't remember whether have I eaten it when I was in Kuching a couple years ago! That is some lovely presentation there! 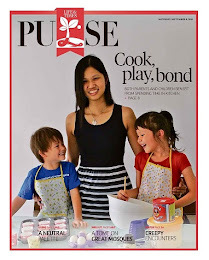 I've only had laksa once and really enjoyed it -maybe it's time to make some at home! This does look very good. Lovely presentation, pretty dishes and the chopsticks are lovely. Haven't really tried sarawak laksa, hard to find here. I have not try Sarawak Laksa before, but it looks very yummy! 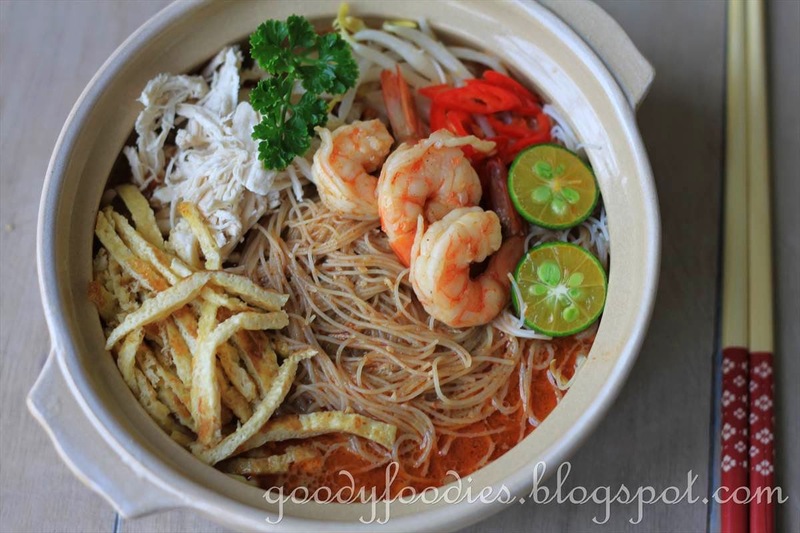 It makes me think of Mee Siam which we have in Singapore :) yummy! Hi Yen, your laksa look exactly like my hometown Kuching's Laksa. I miss them sooooo much! 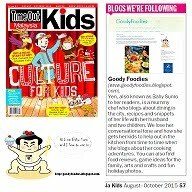 Your laksa looks mouth watering! super...now i am motivated to make it :) thanks! Hi there, I usually get my friends to buy it from Sarawak from me. No idea where you will be able to find it in KL. Chicken stock I make on my own, but you can also use store-bought if you like. 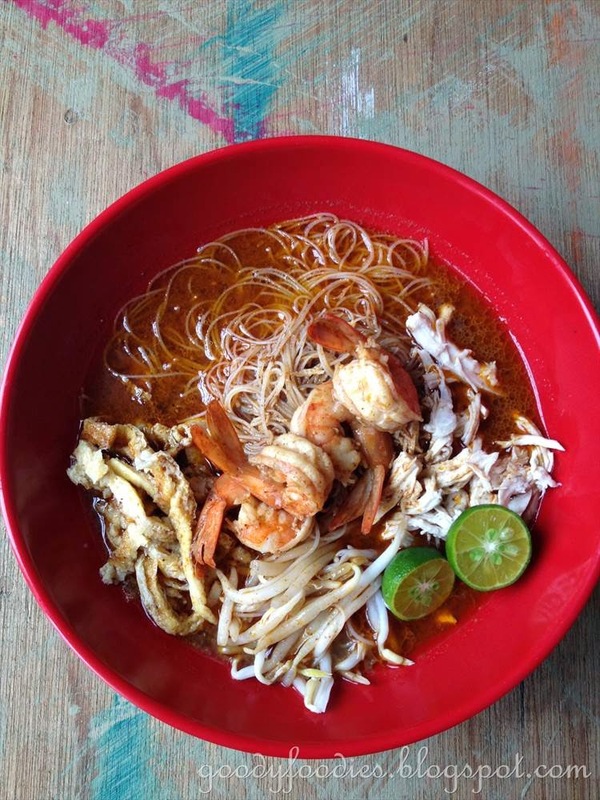 We've heard so much about the uniqueness of Sarawak laksa. 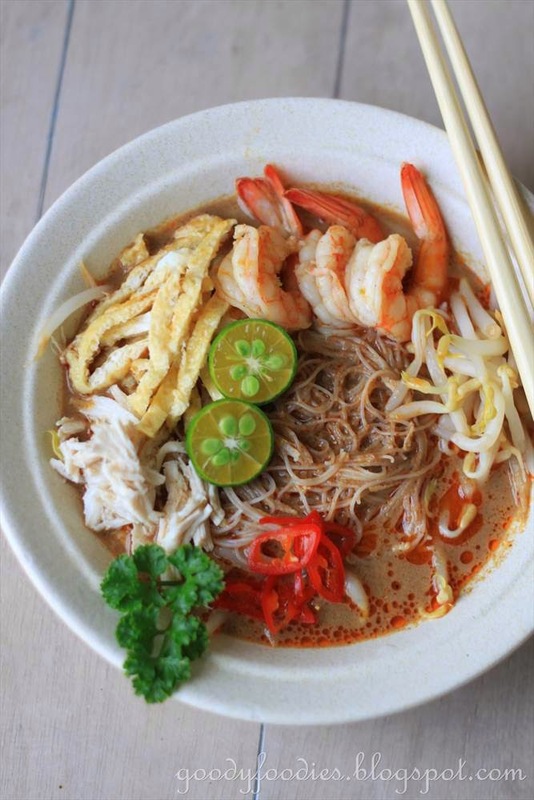 Well, from 17 June 2015 onwards, you can get Sarawak laksa paste in Klang Valley. No more postal order or troubling friends and relatives. Please visit fb www.facebook.com/LaksaPasteSarawak for more information. 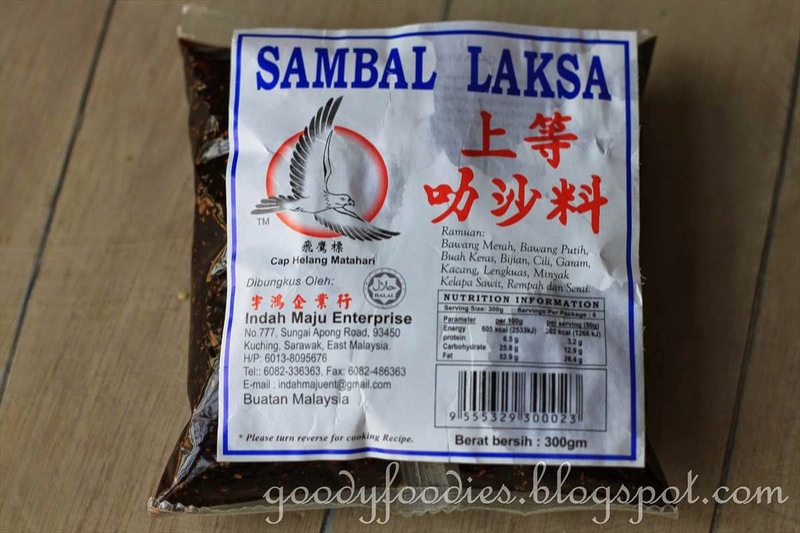 i've tried double red swallow brand laksa paste and its really good! One of their company website is www.sarawaklaksa.com.my. Its a must try! Just got some unbranded Sarawak paste from a market stall in Borneo. Its cold here I think laksa will warm me up. I'm so looking forward to trying this new one. Its odd that there is no tofu in the recipe . I may have to break with tradition and add some. Sorry I am based in KL, not able to get the paste for you.